The honourable Annastacia Palaszczuk, Queensland Minister for Disability and Multicultural Affairs launched MD Awareness Week on 23 May with her very personal story of MD. 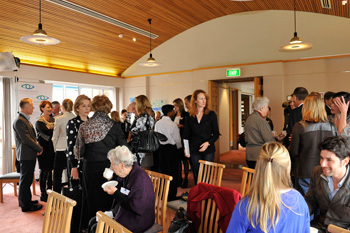 The Sydney launch was attended by our wonderful and supportive Patron Ita Buttrose and our founding Director Dr Paul Beaumont, along with people from the MD community, sponsors, supporters and friends. As part of this year's Awareness Week we commissioned a national Galaxy survey on symptom recognition. Results concluded that there is an alarming risk that people experiencing a symptom of MD will dismiss the symptom thinking they just need glasses or are experiencing computer related eye strain. Our sincere thanks go to Novartis, Blackmores, Optometry Association Australia, and Bluedesk for their ongoing support which enables the week to be held each year. 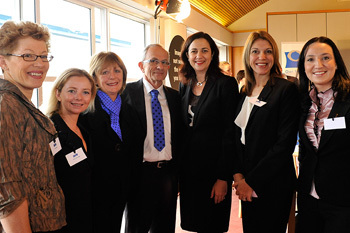 Annastacia Palaszczuk studied Arts/Law at University of Queensland and later entered politics and became the second female lawyer appointed to the Queensland Cabinet. She is Queensland Minister for Disability Services and Multicultural Affairs, represents the electorate of Inala and likes reading, AFL, rugby league, theatre and sailing. Annastacia was diagnosed with the wet form of macular degeneration when she was just 34 years of age. She woke up one morning and noticed a back blurry dot in the centre of her right eye and she knew something was wrong and immediately went to her optometrist the same day. She was referred to an ophthalmologist, then diagnosed with wet MD and was undergoing treatment a couple of days later. Annastacia's depth perception is affected and she has her speeches printed in large font and uses stronger lighting to help with reading. 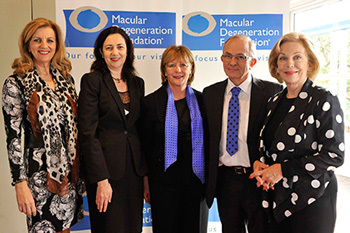 The Minister told the MD Foundation that having macular degeneration has provided her with a greater awareness of the issues facing people who experience vision loss. When she was diagnosed she went straight to the Macular Degeneration Foundation website to find out more information and learn about what was happening to her eyes. The Minister conveyed her personal appreciation of the importance of patient support like the MD Foundation to assist people with disabilities. 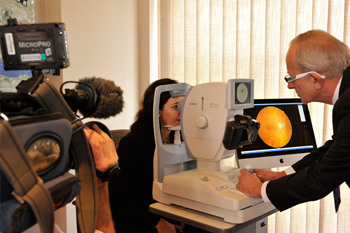 Ms Palaszczuk said she was happy to share her story if it could help prevent someone from losing their vision. 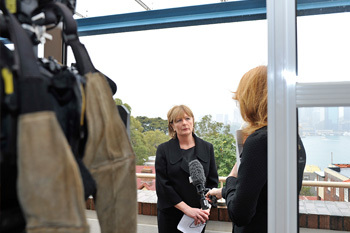 We sincerely thank the Minister for sharing her story with the MD community in our newsletter. 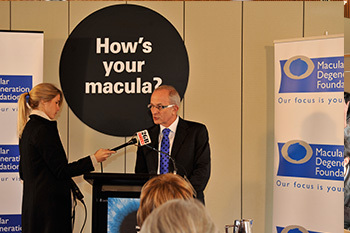 Launching MD awareness week in the media has helped to achieve the Foundation's vision to reduce the incidence and impact of macular degeneration in Australia. 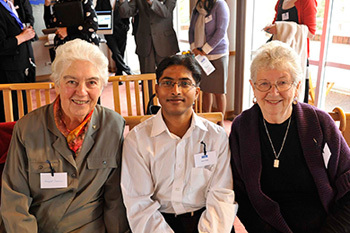 "Early detection and immediate treatment was critical to saving my sight. Six years after being diagnosed my eye sight in my right eye is almost the same as in my left eye. I urge everyone to see go their optometrist if they experience any change in their vision".